Every year, Rotary International has a new president. The president designates a theme he wishes to focus on in his/her Rotary Year of service. Our club was chartered in Rotary Year 2013-2014. 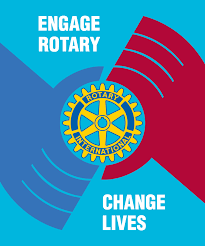 For that Rotary Year, Rotary International's President Ron Burton chose for his theme “Engage Rotary, Change Lives”. The theme is just four words but contains a lot of room for thought. The next word is Rotary. This is our world wide organization whose members are dedicated to the concept of “Service Above Self”. The third word Change is again a proactive word not a passive word. It means to make or become different. For our purposes this is in a positive sense of change for the better. The fourth word Lives refers to the people who we impact as Rotarians and this includes ourselves. Yes, our service projects do bring positive change to the people who we help. But, in the process of helping others we are also help ourselves. Feeling good about what we do for others has been proven to make us happier and healthier people. So, it was really fortunate that Ron Burton chose this theme for his Rotary Year. It aligns with one of the basic premises stated when forming our club – we were going to be a service focused club.